Guy comes up to the bar, orders a whiskey Coke. I make it for him. He has generously been giving me .50 tips all night. What do you do with all that money, right? I make him his drink, he gives me a five, I get him his $1.50 change. He takes the dollar, shoves it in his wallet, then peers down upon the quarters. I’m watching, he’s scrutinizing them. He says, Oh! A ’77. Haven’t seen one of those in awhile. He takes off, leaves the quarters behind. Well, I’m ecstatic at this point. I have been collecting quarters over the years, I have quarters from the first one, to the present, in a glass case in my room. And, guess what year I’m missing? Yeah, that’s right! A ’77!!! 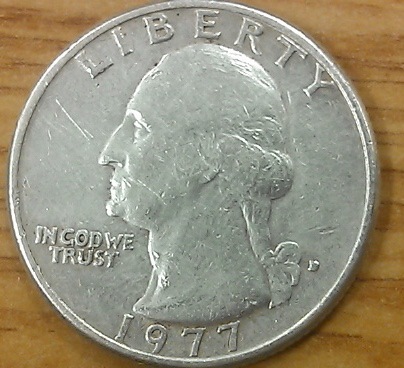 I grab the quarter, look at it, make sure it’s a ’77. This entry was posted in Bar Story on February 3, 2015 by Clint Curtis.